Despite the current cold snap we are having, my thoughts at this time of the year always turn to Summer holidays. Being a woman that likes to dress up, my favourite time of day whilst on holiday is when you have finished with a day of sunning yourself by the pool and you get ready for a perfect Summer night evening with a cocktail whilst the sun sets. 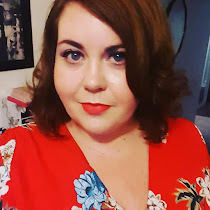 Curvissa challenged myself and four other bloggers to choose an evening maxi dress to style and I chose the Buckle Waist Maxi Dress * which is available in a fantastic sizing range of 10 - 32. When it comes to choosing a maxi dress for the holiday season I look for a bold print with breathable fabric and a nice length that will enable me to wear either heels or sandals depending on where I wish to wear it. 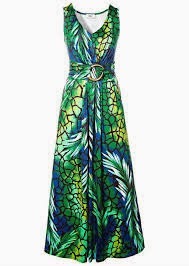 The bold green print (also available in coral) is a real winner for me and the gold buckle detail adds an additional elegant touch to the dress. Happily the dress also comes with pockets which is a particular favourite of mine, especially when you do not want to be laden down with a cumbersome bag. I have worn the dress today as I would wear it for an evening out. I have added a crochet shrug (perfect for when the sun sets and the nights can turn a little chilly), a red crystal necklace to give a contrast colour and some black peep toe heels. Having worn Curvissa pieces before I knew to size up with this maxi dress. The buckle waist maxi dress is available in split sizes and I would advise you to go with one size up. I love the beautiful print of this dress and the length. I have given the dress a 4.5 rating as the sizing was a little bit off, but once you have the fit as you like it, this maxi dress will fit into your Summer wardrobe perfectly.